1. Department of Ophthalmology, The First Hospital of Jilin University, Jilin, China. 2. Department of Radiology, The First Hospital of Jilin University, Jilin, China. 3. Department of . Neurosurgery, The People's Hospital of Jilin Province, Jilin, China. 4. Department of Gastroenterology, The First Hospital of Jilin University, Jilin, China. 5. Department of Cardiology, The First Hospital of Jiamusi University, Heilongjiang, China. Retinal ganglion cells (RGCs) are one of the important cell types affected in many ocular neurodegenerative diseases. Oxidative stress is considered to be involved in retinal RGCs death in ocular neurodegenerative diseases. More and more attention has been focused on studying the agents that may have neuroprotective effects. Nuclear factor (erythroid-derived 2)-like 2 (Nrf2) is a key nuclear transcription factor for the systemic antioxidant defense system. This review elucidates the underlying mechanism of the Nrf2-mediated neuroprotective effects on RGCs in ocular neurodegenerative diseases, such as diabetic retinopathy and retinal ischemia-reperfusion injury. Several Nrf2 inducers that shield RGCs from oxidative stress-induced neurodegeneration via regulating Nrf2 signaling are discussed. Retinal ganglion cells (RGCs), specialized projection neurons, are located adjacent to the inner retinal surface of the eye. These neurons obtain visual information from photoreceptors and are the brain's only portal to the visual world . RGCs can transmit visual information in the form of action potential from the retina to some regions in the brain. RGCs are one of the important cell types affected in optic neuropathies, such as glaucoma and diabetic retinopathy (DR) . Oxidative stress, which is characterized by the overproduction of reactive oxygen species (ROS), such as superoxide anion (O2-), hydrogen peroxide (H2O2) and hydroxyl radical (-OH), is thought to be involved in causing retinal RGCs death in many ocular neurodegenerative diseases, such as glaucoma, DR [2, 3], and retinal ischemia-reperfusion (I/R) injury . Under normal condition, there is a balance between the systemic ROS production and biological antioxidants' capacity to remove the oxidants or to repair the oxidative stress induced damages. Overproduction of ROS or dysfunction of anti-oxidative enzymes can result in oxidative stress and lead to cellular damages (e.g. lipid peroxidation of cell membranes, oxidative damage to DNA and proteins). Nrf2 is a key nuclear transcription factor for the systemic antioxidant defense system. In normal condition, Nrf2 binds to Kelch-like erythroid-cell-derived protein with CNC homology (ECH)-associated protein 1 (Keap1) as a complex and is restricted to the cytoplasm where it undergoes ubiquitination and proteasomal degradation. Under the stressed condition, Nrf2 is separated from Keap1 (a primary Nrf2 inhibitor) and is translocated into the nucleus where it binds to the phase 2 of antioxidant response element (ARE) in the DNA promoter region. Then, Nrf2 initiates the transcription of ARE controlled anti-oxidative enzymes, such as superoxide dismutase (SOD), catalase, glutathione S-transferase (GSTP) , NAD (P)H: quinone oxidoreductase 1 (NQO1) , heme oxygenase-1 (HO-1) , thioredoxin reductase (TrxR), glutathione reductase (GR) and glutathione-S-transferase (GST) [8, 9], which detoxify ROS through glutathione (GSH) regulation . Nrf2 is known as the molecular switch of the Nrf2 signaling (also known as Nrf2/Keap1 or Nrf2/Keap1/ARE signaling) and serves as a foremost component of ROS signaling pathway that can be activated by oxidative stress inducers, such as sulforaphane (SF) , hyperoside , hyperglycemia  and inhibited by oxidative stress factors such as homocysteine (Hcy) , O2 fluctuation  and hypoglycemia under hypoxia . The protective role of Nrf2 against oxidative stress in ocular diseases has been explained in the following researches: DR , retinal I/R injury , etc. Nrf2 also promotes neuronal survival in neurodegeneration, acute nerve damage  and optic neuritis [17, 18]. Increasing evidences have demonstrated that oxidative stress leads to the loss of RGCs in many ocular neurodegenerative diseases. More attention has been focused on studying the agents which may confer the role of neuroprotection. This review sets out to elucidate the underlying mechanism of the Nrf2-mediated neuroprotective role in RGCs in ocular neurodegenerative diseases, such as DR, retinal I/R injury, and highlight several Nrf2 inducers which shield RGCs from oxidative stress-induced neurodegeneration via regulating Nrf2 signaling. DR is the most common complication of diabetes and the foremost cause of vision loss in adults. DR has been considered as a vascular disease for a long time. Lately, it is detected that retinal neuronal cells can also be influenced by high glucose stress, and ROS is associated with DR . The injury of RGCs is the essential pathological characters of retinal neurodegeneration induced by diabetes. Mounting attention is drawn to find strategies for defending against RGCs injury. Long noncoding RNAs have been found as key regulators of pathological courses of diabetic complication, such as cell proliferation, immune response, as well as an inflammatory reaction [19-22]. Sox2 overlapping transcript (Sox2OT), a long non-coding RNA , is greatly enriched in the human brain detected by qRT-PCR analysis. The retina and optic nerve are a part of the human brain. Li et al. found that Sox2OT expression is considerably decreased in the retinas of diabetic mice as well as in the RGCs with high glucose. Sox2OT knockdown shields RGCs against high glucose-stimulated damage in vitro and has a neuroprotective role in DR-related neurodegenerative disorders in vivo. Recently, Nrf2 has attracted the extensive interest of researchers exploring its role in inflammatory disorders as well as neurodegenerative diseases [25, 26]. Additionally, Protein-IP experiments found that Sox2OT knockdown could interrupt Nrf2/Keap1 connection in the cytosol of RGCs and lead to the accumulation of Nrf2 protein as well as nuclear translocation. Thus, Sox2OT knockdown also plays an anti-oxidative role through regulating Nrf2/HO-1 signaling pathway. Sox2OT knockdown could be a promising approach for the treatment of diabetic retinal neurodegeneration. SRF is a transcription factor extensively expressed in the MADS-box gene family [27-29]. SRF can regulate gene expression through binding with serum response elements located in the promoters of the major immediate-early genes, such as c-fos, early growth response protein 1 (EGR-1), as well as tissue-specific genes , which has been involved in apoptosis, cell proliferation [31, 32], and oxidation resistance . Fos-related antigen 1 (Fra-1) is an oncogene, which encodes a nucleoprotein Fos [34, 35]. It is reported that Fra-1 is essential in controlling oxidative stress and regulating expression of Nrf2 . Cao et al. reported that SRF up-regulated the expression of Nrf2 to shield against damage induced by high-glucose in the RGCs via controlling the expression of Fra-1. A better understanding of the potential mechanism of RGCs injury induced by high glucose might provide new insight into the DR treatment. LC plays a vital physiological role in transporting the long-chain fatty acids for oxidation and ATP generation. In the human body, LC is originated from both endogenous biosynthesis (25%) and dietary sources (75%). Several experiments and clinical studies revealed that LC treatment exerts positive effects on some disorders in relation to oxidative stress , as well as high glucose-induced oxidative stress in RGCs . HO-1 is one of the important enzymatic antioxidants involved in defense system. A lot of signaling molecules are regulating the initiation of HO-1, among which Nrf2 is a key transcription factor of HO-1. γ-glutamylcysteine synthetase (γ-GCS) is an essential scavenger of ROS, which is regarded as a potential therapeutic target for several cancers . Recently, Cao et al. found that LC treatment was correlated with an increased level of Nrf2, γ-GCS and HO-1, as well as a reduced expression of Keap1 protein in high glucose-stimulated RGCs. These results indicate that LC can protect the RGCs against high glucose-induced oxidative injury via Nrf2/Keap1 signal pathway . Calpains, the intracellular cysteine proteases, play important roles in various cell processes, such as cell proliferation, signal transduction and apoptosis . Both calpain-1 and calpain-2 are the main calpain isoforms . Calpains are triggered by locally raised intracellular Ca2+ levels via calcium channels . Moreover, it is also related to the degradation of the substrates like α-fodrin that forms the membrane skeleton  and induces the apoptosis pathway . Lately, inhibition of calpain signaling is regarded as a therapeutic target for DR. Calpastatin, an endogenous specific inhibitor can regulate the level of calpain by binding as well as inhibiting calpain when the levels of calcium are high and releasing it once the levels of calcium decrease . SNJ-1945, a potent exogenous calpain inhibitor, was detected to possess a neuroprotective effect against the degeneration of retinal cell in mouse glaucoma models . Shanab et al. used Nrf2 knockout (KO) mice to induce oxidative stress and explored the association between ROS and calpain activation. They reported that calpain played a key role in metabolic-stimulated RGCs degeneration induced by hyperglycemia and oxidative stress. Retinal cells cultured with high-glucose without antioxidants presented more RGCs death than those with the treatment of antioxidants. SNJ-1945 considerably protected RGCs against oxidative stress induced by high glucose. Nrf2 KO mice under hyperglycemia stimulation are vulnerable to oxidative stress. RGCs deaths were drastically increased in Nrf2 KO mice, and are decreased notably by SNJ-1945. Both antioxidant and calpain inhibition (Calpastatin and SNJ-1945) provide more opportunities for future neuroprotective management against RGCs death in DR .
Retinal ischemia leads to the degeneration of retinal neurons and plays a vital role in the pathogenesis of severe blinding diseases. Reperfusion of the retina following ischemia contributes to oxidative stress, which is marked by the ROS production and inflammatory responses [49-51]. Oxidative stress plays an essential role in neurodegeneration which is exhibited by the loss of RGCs . As a key regulator of the antioxidant response, the potential retinal neuroprotective function of Nrf2 after I/R injury is increasingly appreciated [4, 53, 54]. Recently, FDA has approved the fumaric acid ester dimethyl fumarate (DMF) for the treatment of multiple sclerosis based on the neuroprotective and anti-inflammatory effects. After ingested, DMF is quickly metabolized to MMF, which is the active metabolite of DMF [55, 56]. Particular attention has been paid to its potential role as a neuroprotective drug for retinal diseases . It has also been revealed that MMF exerts neuronal protection in the retina after I/R injury through the Nrf2 signal pathway. MMF treatment considerably improved the expression of Nrf2-regulated anti-oxidative genes, decreased inflammatory gene expression, reduced neuronal cell loss in the ganglion cell layer, and improved the function of the retina after retinal I/R injury in WT mice. The CDDO-Im is a potent Nrf2 activator, which inhibits ROS increment in the retinal neuronal cell line 661W under oxidative stress. In wild-type (WT) mice, it increased the survival of neuronal cells after I/R injury but not in Nrf2 KO mice . These findings reveal that Nrf2 has a retinal neuroprotective function against I/R injury and indicate that activation of Nrf2 might be a therapeutic strategy . Oxidative stress is also revealed to participate in nerve crush (NC)-triggered RGCs death. The number of RGCs in Nrf2 KO mice was dramatically lower than that of WT mice after NC. Dramatically, CDDO-Im eliminated the NC-triggered RGCs loss in WT mice by activating Nrf2 translocation and initiating the transcription of phase II as well as antioxidant genes (Nqo1, Gsta4, Ho-1 and Txnrd) indicating that pharmacological reagents which up-regulate Nrf2, such as CDDO-Im, may serve as a potential therapeutic alternative to counteract oxidative stress and protect RGCs . Extracted from vegetables, SF exhibit protective effects against oxidative damages in many tissues [59-62]. These protective effects can be promoted by Nrf2-mediated induction of antioxidant enzyme HO-1. I/R increased ROS production, caused marked inflammation, induced the apoptosis of RGCs and led to the thinning of the inner retinal layer. However, these effects were reduced or eliminated by SF pre-treatment. Furthermore, SF pre-treatment notably raised the nuclear accumulation of Nrf2 and the expression of HO-1 in the I/R retinas. Alternatively, ZnPP, the HO-1 inhibitor, reversed the antioxidant effects of SF on I/R retinas. Thus, SF had antioxidant effects on I/R retinas via the activation of the Nrf2/HO-1 pathway . LBP, extracted from the wolfberries, is a traditional Chinese medicine with the proposed effect of anti-aging . Various researches have revealed the beneficial effects of LBP in various tissues [65-68]. Recently, several studies have examined its protective effects in some ocular disease models, such as protecting RGCs in permanent middle cerebral artery occlusion -induced retinal I/R [69, 70]. He et al. reported that LBP treatment drastically increased the nuclear accumulation of Nrf2 and the expression of HO-1 in the retina after I/R injury. It also reversed the increased apoptosis and declined a number of viable cells detected in the ganglion cell layer (GCL) in I/R retina. These results reveal that LBP partially exerts its beneficial neuroprotective effects through activating the Nrf2/HO-1 pathway. Nevertheless, the drugs studied above are in early stages , clinical trials or human safety data are still needed. LRIC offers a physiologic strategy for managing the body's endogenous protective abilities against injury caused by I/R in the central nervous system [72, 73]. Zhang et al. reported that LRIC might be used as a noninvasive neuroprotective approach, which provides retinal protection from I/R injury via the upregulation of antioxidants such as Nrf2 and HO-1. Both of them might be used as biomarkers of I/R injury, and pharmacologic agents could be focused on the Nrf2 and HO-1 signal pathway . As both of them are related to clinical applicability, further studies should be desired to differentiate and calibrate changes in Nrf2 and HO-1. Ultraviolet (UV) is an electromagnetic radiation with a wavelength of 10-400 nm, which is longer than X-rays and shorter than visible light. UV radiation-induced ROS production and cell death in cultured human RGCs. Activation of Nrf2 signaling could protect cells from UV radiation . MicroRNA-141, a Keap 1 inhibitor, provoked Nrf2 activation and nucleus translocation in UV-exposed RGCs. Then the transcription of ARE controlled antioxidant genes (NOQ1, HO-1, γ-glutamylcysteine ligase catalytic subunit) is enhanced which leads to the attenuation of UV-induced oxidative stress and cell death . In opposite, there is depletion of microRNA-141 up-regulated Keap1 expression and accelerated Nrf2 degradation leading to the aggravation of UV-induced death of RGCs . These results demonstrate that microRNA-141 targets Keap1 to provoke Nrf2 activation and attenuates UV-induced oxidative stress in RGCs . H2S, an endogenously produced gas by the human body participates in physiological processes, such as neuronal survival, ROS elimination, vasodilation, and inflammation [76-79]. It has been considered as one of the important cellular neuromodulators . Combination of both glutamate (Glu) and buthionine sulfoximine (BSO) was employed to induce the oxidative stress in the cultured mouse RGC-5 cells. cell viability and apoptosis assay revealed that the H2S releasing compounds (ADTOH and NAHS) inhibited Glu/BSO-induced cell death in cultured RGC-5 cells by up-regulation of Nrf2, HO-1, GST, GSH, p-serine-threonine kinase (p-Akt), Protein kinase C alpha (PKC-α), X-linked inhibitor of apoptosis protein (XIAP), B-cell lymphoma 2 (Bcl-2), and down-regulation of NF-κB . These results implicate that H2S donor compounds are promising neuroprotectants in the treatment of neurodegenerative diseases . R-LA is a cofactor for α-ketoglutarate dehydrogenase and pyruvate dehydrogenase . It was reported that R-LA possesses the antioxidant ability that may reduce the lipid peroxidation in aging rats  as well as protect RGCs against I/R induced injury . It was also revealed R-LA have a dramatic neuroprotective effect against oxidative stress-triggered the RGC-5 cell death cultured in vitro by promoting the Nrf2 translocation to the nucleus and increasing the expression of anti-oxidative enzyme HO-1 via the regulation of phosphoinositide 3-kinase (PI3K)/Akt pathways. In addition, R-LA transiently produced ROS. Meantime, ROS scavenger N-acetyl-L-cysteine (NAC) or NADPH oxidase inhibitor (Diphenyliodonium chloride) prohibited R-LA-triggered Nrf2 translocation and HO-1 generation. R-LA dramatically attenuated RGCs cell death and accumulation of 4-hydroxy-2-nonenal (4-HNE), a final product of lipid peroxidation, in the retina of mouse induced by optic nerve injury through regulation of HO-1. R-LA exhibited the neuroprotective role in retinal neurons against oxidative stress by inducing HO-1 via Nrf2 signaling pathway . Nipradilol has nitric oxide (NO)-donating as well as α1- and β-adrenoceptor antagonist properties. It is known as an anti-glaucomatous agent clinically. It also exhibited a significant neuroprotective effect against oxidative stress-induced RGCs death in cultured RGC-5 cells and optic nerve injury in mice model. NO scavenger dramatically reversed the neuroprotective effect of nipradilol. It was further proved that the neuroprotective effect of nipradilol against oxidative stress-induced RGCs death was through a HO-1 activity-dependent mechanism by inducing Keap1 S-nitrosylation, Nrf2 nucleus translocation and transcription of HO-1 (a NO-dependent antioxidant enzyme). These results elucidate a potential neuroprotective effect of nipradilol against oxidative stress-induced the death of RGCs . Genipin is an herbal iridoid with neuroprotective effects. IPRG001, a genipin derivative, was reported to protect the H2O2 induced cell death in cultured rat RGC-5 accompanied by the increased antioxidant enzymes production (such as HO-1) and NO generation. NOR1 (a NO donor) showed a similar tendency of neuroprotective effects with IPRG001 by increasing the cell viability and HO-1 expression in RGC-5, while c-PTIO (a NO scavenger) or cycloheximide (a protein synthesis inhibitor) completely inhibited the protective action of PRG001. Furthermore, IPRG001 induced HO-1 expression was found to be regulated via inducing the S-nitrosylation of Keap1 and the nuclear translocation of Nrf2. Nrf2 redistribution was blocked by wortmannin (a PI3K inhibitor) and overexpression of HO-1 was inhibited by the combined application of wortmannin and LY294002 (also a PI3K inhibitor). Accompanied by HO-1 generation, pre-exposure to IPRG001almost totally diminished the optic nerve injury (ONI) induced apoptosis and 4-HNE overexpression in RGCs of rat retina in vivo. These results indicate that IPRG001 protect the RGCs against oxidative stress through the PI3K/Nrf2/ARE pathway via S-nitrosylation of Keap1 and genipin and can be a promising therapeutic medication for degenerative neuronal diseases . T-butyl peroxide (t-BOOH) and H2O2 treatment are usually used as an exogenous source of ROS to imitate external oxidative stress, whereas GSH depletion is usually employed to imitate the endogenous oxidative stress, and all these three insults may lead to oxidative stress induced RGC-5 cell death in vitro studies. Mounting evidence has shown that the plant-derived flavonoids which are abundant in vegetables and fruits have neuroprotective effects. Additionally, different flavonoids exhibits distinct neuroprotective pattern against oxidative stress-induced RGC-5 cell death. Several flavonoids such as quercetin, induced HO-1 expression via the Nrf2/ARE pathways, indicating that some flavonoids may serve as promising neuroprotective natural medication for RGCs . Sulbutiamine stimulated the production of GST along with GSH and eliminates ROS. NAC inhibited glutamate/buthionine sulfoximine (GB)-inducing the death of RGC-5 cells cultured in vitro. Furthermore, sulbutiamine significantly increased HO-1, Nrf2 and catalase expression. NAC and sulbutiamine show different neuroprotective functions in GB via different mechanisms . Accumulating evidences show that oxidative stress is one of the major mechanisms involved in the loss of RGCs in several eye diseases and aging process that increases the injury in RGCs through various processes such as, oxidation of proteins, DNA damage, apoptosis, cell death, etc. The Nrf2/Keap1/ARE signaling pathway is considered as one of the main cell defense mechanisms against oxidative stresses. Thus, the induction of the Nrf2/Keap1/ARE signaling pathway has been estimated as an important target for a neuroprotective role in RGCs. Selected studies on the relationship between Nrf2 inducer/suppressor and RGCs-related diseases were reviewed in this article. Various researches have shown that Nrf2 possesses notable effects on protecting or deteriorating RGCs against oxidative stress, decreasing the aberrant proteins and preventing or causing the RGCs-related disorders (Table 1), such as DR (Figure 1) and I/R (Figure 2). All these encouraging effects have been linked with the antioxidant effects of Nrf2 inducing compounds. In summary, the Nrf2/Keap1/ARE signaling pathway may be a promising therapeutic target against oxidative stress for RGCs-related diseases. 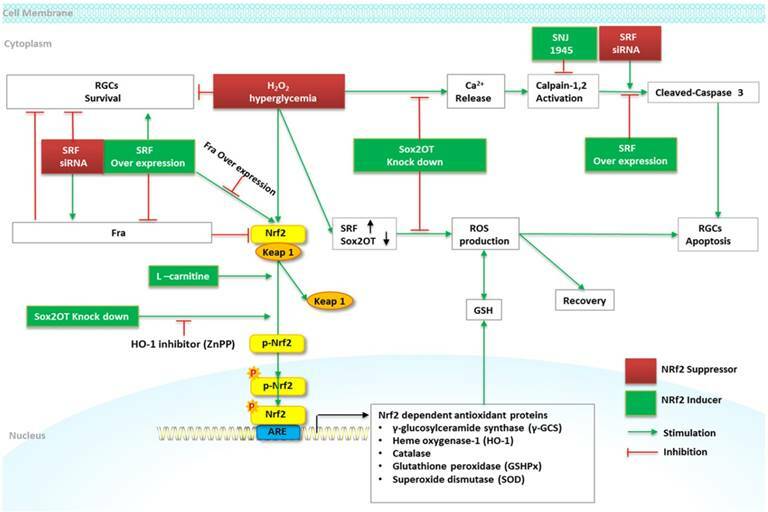 Schematic diagram of Nrf2 signaling and regulation of RGCs in DR. High glucose and H2O2 treatment induces a marked reduction of RGCs viability and increases RGCs apoptosis. Sox2OT knockdown partially reverses high glucose-induced reduction of RGCs apoptosis, and increases Nrf2 and HO-1 protein expression by inducing Nrf2 protein accumulation and nuclear translocation. ZnPP (HO-1 inhibitor) alleviates the beneficial role of Sox2OT knockdown against oxidative stress. The overexpression of SRF attenuates high glucose induced RGCs apoptosis via caspase-3 activity and maintains the cell viability. SRF augments the expression of Nrf2 via the downregulation of Fra-1; overexpression of Fra-1 abolishes the effect of SRF overexpression on Nrf2 and abrogates the protective effect of SRF overexpression on RGCs survival treated with high glucose. L-carnitine increases Nrf2, γ-GCS, HO-1, and decreases Keap1 protein in high glucose stimulated RGCs. SNJ-1945 declines high glucose-induced RGCs deaths. 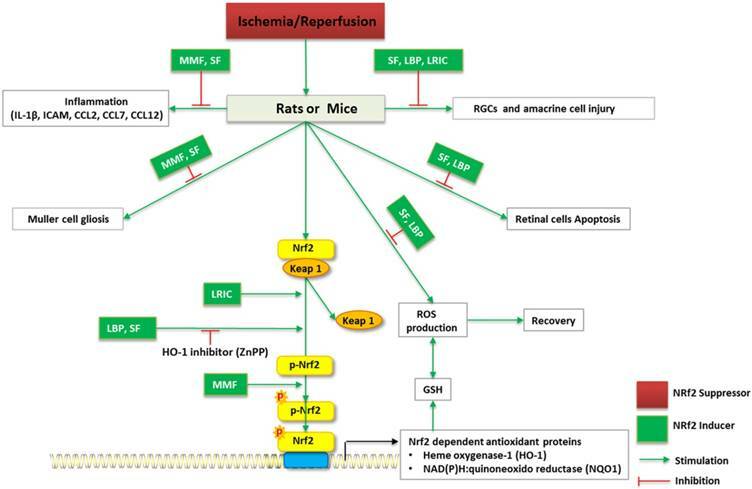 Schematic diagram of Nrf2 signaling and regulation of RGCs in I/R in vivo. I/R induce RGCs and amacrine cell injury, ROS overproduction, inflammation of retina, Muller cell gliosis, as well as retinal cell apoptosis. MMF, SF, LBP, LRIC may reverses I/R-induced neurodegenerative damage to the eye. ZnPP (HO-1 inhibitor) alleviates the beneficial role of LBP, SF against oxidative stress. In vivo STZ-induced Diabetic mice Sox2OT knockdown had a neuroprotective role in diabetes-induced neurodegeneration. In vivo Nrf2 KO mice Hyperglycemia-provoked RGCs deaths were increased in Nrf2 KO mice, and declined by SNJ-1945. In vivo Nrf2 KO mice CDDO-Im increased neuronal survival after I/R injury in WT, but not Nrf2 KO mice. ONI In vivo Mouse RGCs Nipradilol suppressed RGCs death and accumulated 4-HNE after injury through an HO-1-dependent mechanism. ONI In vivo Rat RGCs IPRG001diminished the ONI induced apoptosis and 4-HNE overexpression in RGCs. Abbreviation: Sox2OT, Sox2 overlapping transcript; SRF, Serum response factor; LC, L-Carnitine; MMF, monomethyl fumarate; DMF, f umaric acid ester dimethyl fumarate; SF, Sulforaphane; LBP, Lycium barbarum polysaccharides; LRIC, Limb remote ischemic conditioning; ARPE-19, human retinal pigment epithelial (ARPE-19) cells; H2S, Hydrogen sulfide gas; R-LA, R-a-lipoic acid; UV, Ultraviolet; RGCs, retinal ganglion cell; I/R, ischemia-reperfusion; STZ, streptozotocin; HFD, fed a high fat diet; KO, knockout; The retinal neuronal cell line 661W; ONI, Optic nerve injury. RGCs: retinal ganglion cells; DR: diabetic retinopathy; ROS: reactive oxygen species; H2O2: hydrogen peroxide; I/R: ischemia-reperfusion; Nrf2: transcription factors like nuclear factor (erythroid-derived 2)-like 2; Keap1: Kelch-like erythroid-cell-derived protein with CNC homology (ECH)-associated protein 1; ARE: antioxidant response element; SOD: superoxide dismutase; GSTP: glutathione S-transferase; HO-1: heme oxygenase-1; TrxR: thioredoxin reductase; GR: glutathione reductase; GST: glutathione-S-transferase; GSH: glutathione; SF: sulforaphane; Hcy: homocysteine; Sox2OT: Sox2 overlapping transcript; SRF: serum response factor; EGR-1: early growth response protein 1; Fra-1: fos-related antigen 1; LC: L-Carnitine; γ-GCS: γ-glutamylcysteine synthetase; KO: knockout; MMF: monomethyl fumarate; DMF: fumaric acid ester dimethyl fumarate; NC: nerve crush; WT: wild-type; LBP: lycium barbarum polysaccharides; GCL: ganglion cell layer; LRIC: limb remote ischemic conditioning; UV: Ultraviolet; RPEs: retinal pigment epithelial cells; H2S: Hydrogen sulfide gas; Glu: glutamate; BSO: buthionine sulfoxime; Akt: serine-threonine kinase; PKC-α: protein kinase C alpha; XIAP: X-linked inhibitor of apoptosis protein; Bcl-2: B-cell lymphoma 2; R-LA: R-α-lipoic acid; NAC: N-acetyl-L-cysteine; 4-HNE: 4-hydroxy-2-nonenal; NO: nitric oxide; ONI: optic nerve injury. The study was funded by Development and Reform Commission of Jilin province 2015Y031-1. The topic was conceptualized by CL. CL, XL and DZ contributed to the literature database search, and writing of the manuscript. CL, TX, JQ and JH contributed to vital revising. TH and OP contributed to English Polishing.